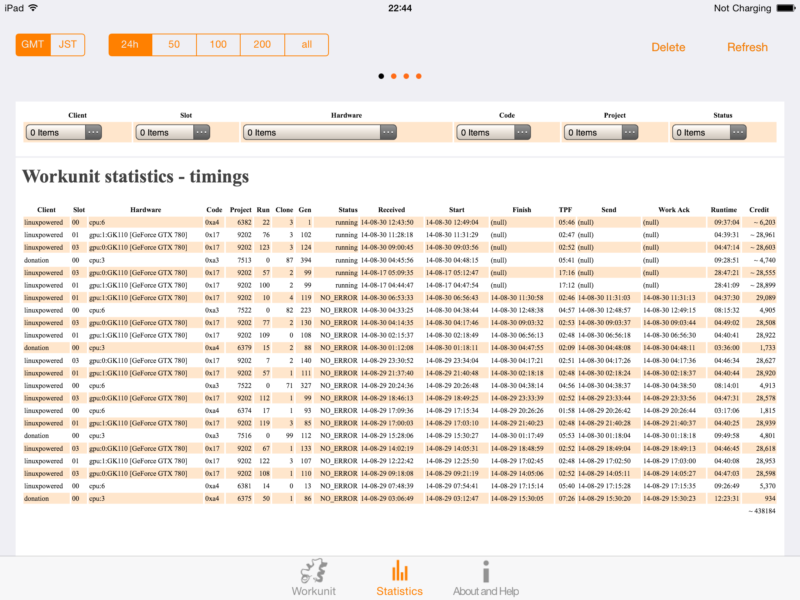 I'm more then happy to share with you that my iPad monitoring app got finally approved and should be available in AppStore for free. I wrote the app mainly for myself to look after my boxes while not at home or at least not at my desk. If you have an iPad and want to try: please give it a shot. After entering hostname, port and remote password the app will connect via 3rd party API to client v7 gathering actual information about folding progress. You can define multiple clients. Zoom in/zoom out gives you different amount of data. I'm right now also preparing a support site under http://fahmm.net in case you face issues. If you have any suggestions or enhancement ideas please let me know, too. What in planning is: data storage in iCloud, full access to config parameter, visualization of trajectory (hope I can make that). Thanks for your work. I use this app all the time. I highly recommend it to those with an ipad. Nice! Thanks for your efforts! Excellent work! Thanks, giving it the run through right now. Much appreciated! HaloJones wrote: can i get this on my iphone? Finally a new version just got released to AppStore, now as universal app. Running on iPad still gives the better experience. Last edited by ChristianVirtual on Thu Sep 11, 2014 4:12 pm, edited 2 times in total. Not working for me on iPhone 4, iOS 7.1.2. 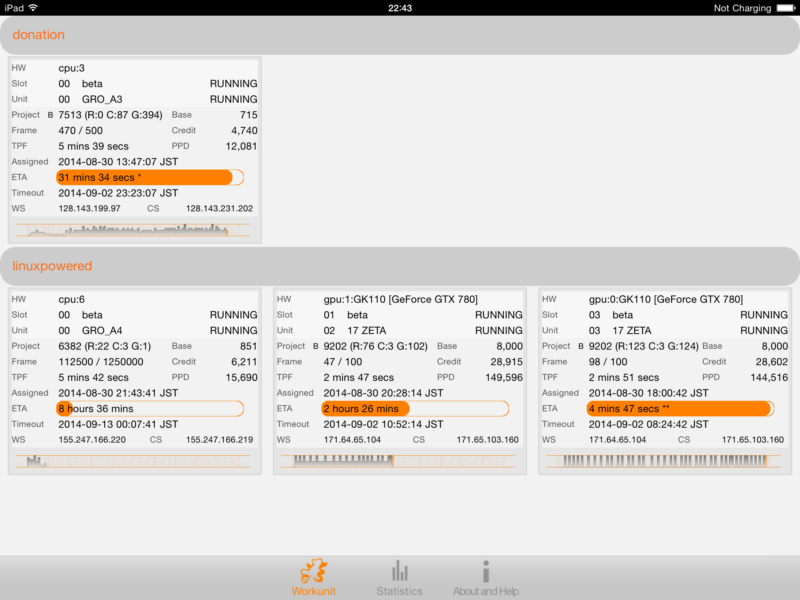 App launches, showing blank Workunit panel. I'm thinking the Add panel should be shown at launch if no clients have been added, and none will be auto added from mDNS. Tapping the Add button, I see a flash of a config panel, then it goes back to the Workunit panel and moment later a line appears "<hostname, please configure>". I cannot configure the added client, nor delete it. Tapping Add again creates another such entry. When you long-press on those boxes a context menu will show up and guide you to the config screen and let you enter client-name, hostname/IP, port and password. Once entered you can activate or deactivate a client with the switch. clientname can be different from hostname; I use that for EC2 instances where the IP is changing each bid but I want to keep all points under one logical name. iP4 with 7.1.2 should work, that's one of my test devices too. 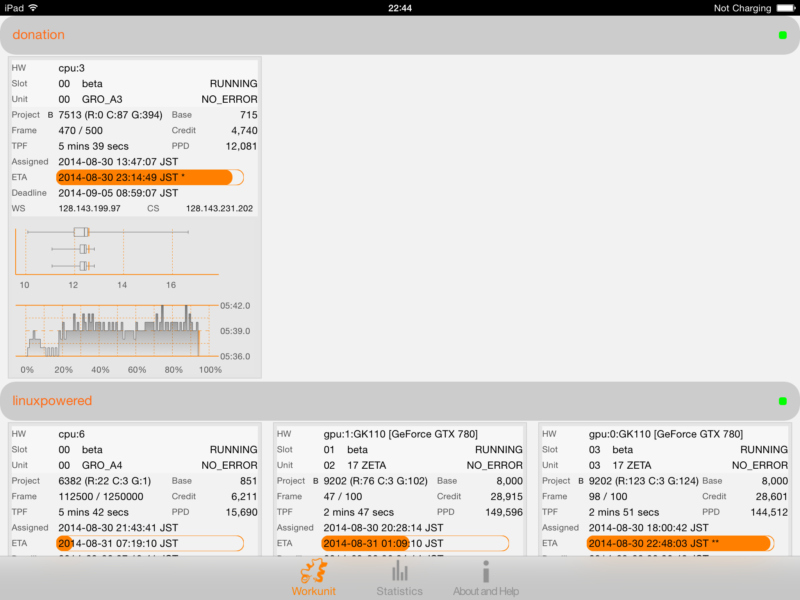 avahi-publish -s linuxpowered _fahclient._tcp 36330 "FAHClient on %h"
After starting the mobile monitor on iPad the client get automatically discovered and created as item with identical client name and hostname/IP (here: linuxpowered); though the password for remote connection need to be entered if required by FAH config. 1. 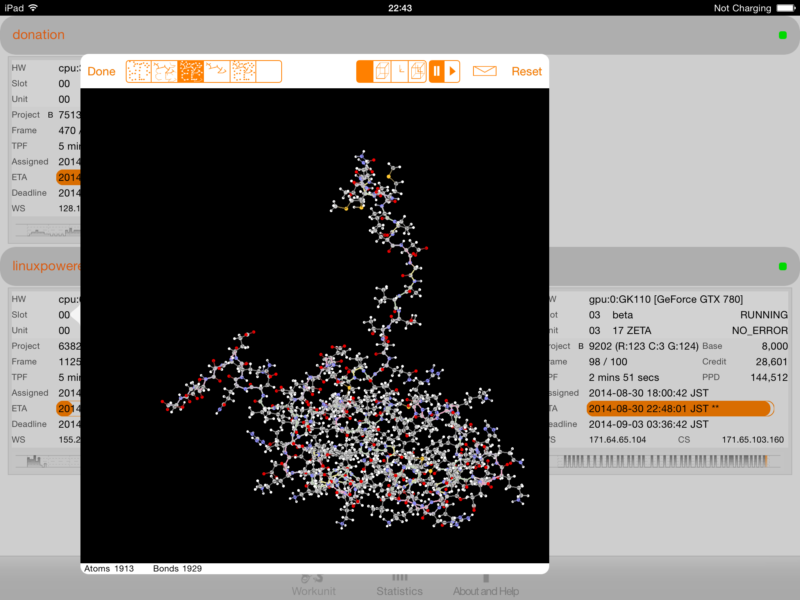 Improvements in the visualization of proteins (incl a simple 3D viewer; you need simple glasses to enjoy). 2. Push notification to inform you when the global available statistics for your donor IDs got changed. 4. Table-based configuration tool for folding clients (e.g. slot size, client type, ...). Per design it is not possible to change remote password or passkey; for those please proceed as usual today. This might be added in future version based on demand. 5. Ability to connect via SSH tunnel to your folding systems; the required keys you can create direct on the device; though the public key need to be manually added to the folding clients or the SSH tunnel your primary connect to. Just want to say I love the app. Allows me to be lazy and monitor my slots on my iPad from the couch. Question though. What are the graphs at the bottom of the slots displaying?